Experience God's Love. Praise Him and be bless with this one-night-only concert from Planetshakers. Brought to you by BMI. Grab your tickets now! 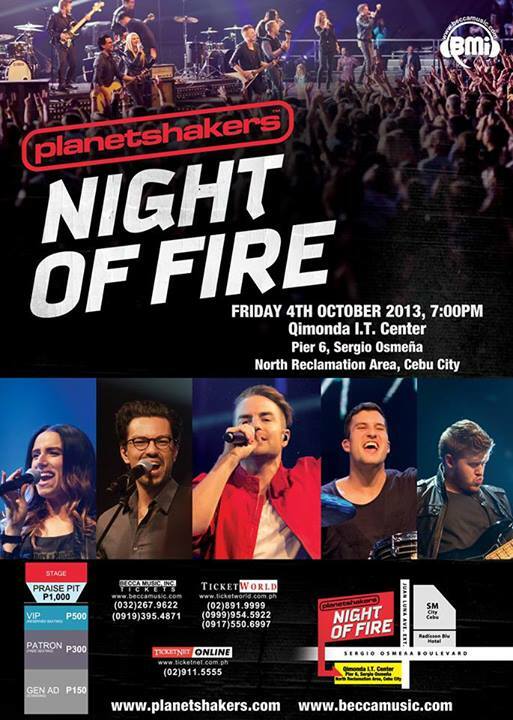 Get ready to be fired up for Jesus with PLANETSHAKERS: Night of Fire this October 4, 2013 at the Qimonda I.T. Center in Cebu City! Planetshakers: Night of Fire is about empowering the local church through a meaningful and impacted encounter with God. Worship our true Lord and Savior together with the critically-acclaimed Australian worship band, the PLANETSHAKERS in the city of Cebu -- their ONLY stop in the Philippines as part of their Nights of Fire tour! PLANETSHAKERS is passionate to see generations worldwide unite together to worship God. Their heart is to see people encounter God, be transformed by his presence and empowered to make a difference in their world. Hailing originally from Adelaide, the Planetshakers Band is now based in Melbourne at Planetshakers City Church, under the leadership of Senior Pastors Russell and Sam Evans. With over 20 internationally acclaimed albums, the band tour annually to the USA, UK, Europe, South Africa, South East Asia, Australia and New Zealand. Since 1997, the band has grown substantially with two teams now travelling the globe regularly. The Planetshakers first visited the Philippines in 2008, and has been visiting almost annually since. This year, the band will only visit Cebu City as part of their Nights of Fire tour.